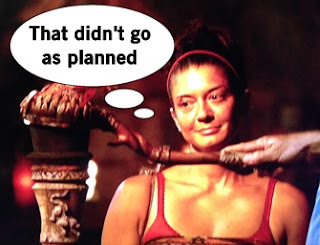 The Brawn Tribe continues to be a hot mess after their first Tribal Council. Alecia fully understands her bottom placement in the tribe and tries to show her worth by spending 6 hours trying to make fire. She eventually succeeds and impresses the tribe, who celebrate by feasting on a chicken, but Alecia didn't do much to change her safety in the tribe. Another person on the bottom of their tribe is Tai, who despite having the most adorable bromance with Caleb, is the likely first boot if the Beauty tribe were to lose. Tai resumes his search for the Hidden Immunity Idol and resists the urge to rip trees from the ground this time to look in tree holes. Voila! It's another clue to the idol which is high up in the trees. With all his might, Tai attempts to climb the tree to fetch the idol but ripped apart bloody feet and the sheer height makes it an impossible task. The Brains tribe appears to be bonded after their first win, but water causes drama for the tribe this week. Liz insists on boiling the water, while Debbie maintains you can drink it as is. But Debbie is a superwoman afterall. The tribe discovers most of the kerosene they won in last week's Immunity Challenge is nearly gone after Joe uses too much to make a fire, then the bottle tips over and empties most of its contents. Joe and Liz get into a fight over making fire to boil the water, which leads her to cry alone about being thirsty. Drink the tears, Liz - it's hydrating! The Immunity Challenge this week has the tribes carrying or pushing a big, heavy log through the ocean and between obstacles, ending with shooting a ball at targets via a slingshot. The Beauty tribe is a cohesive group that is able to work together and wins immunity along with a baller fishing kit. Despite the intake of chicken, the Brawns fail to win a challenge yet again and will face Tribal Council. Alecia begins to search for the Hidden Immunity Idol to avoid her inevitable fate. Until something interesting happens: Jennifer doesn't like how Jason does nothing except talk crap about Alecia all day. Jennifer suggests to Alecia and Cydney the idea of getting out the stronger players now and making a move. But then Jennifer changes her mind and decides she'd rather stick with the foursome, which surprises Cydney that Jennifer is flip flopping so much. Tribal Council time! Alecia hopes that now that she's pulling her weight she might not be the one to go. Jennifer pretty much outs the fact that she has been considering that idea of turning on her core alliance, which shocks them all. Jennifer insists nothing has changed, it was just an idea tossed around and Alecia is the one who suggested the all-girl alliance (and Alecia says it was Jennifer). 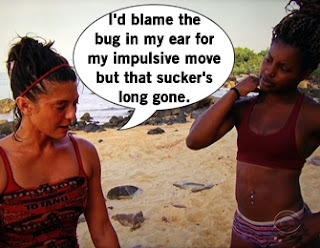 Jennifer admits her wrong and pleads for the tribe to keep her to stay strong, because having Alecia stick around guarantees another challenge loss. Then Jennifer insists she was trying to give Alecia a nice last day by leading her on, continuing her downward spiral but literally jumping onto her tree stump seat to beg for mercy. Probst is eating it up. 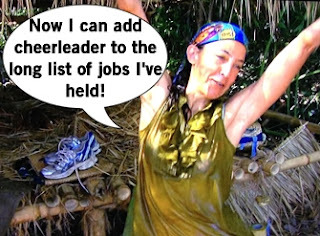 It's too late though and the lack of trust in Jennifer gets her voted out of the Brawn tribe.